Maybe this has been answered, but I haven't found a good answer. 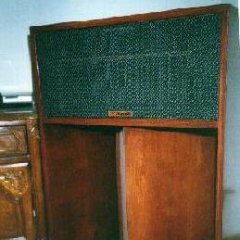 I'm the original owner to a pair of Heresy 1 speakers, vintage 1975 birch unfinished, that I bought while in college. I love these speakers. I'm no audiophile, but I like them and wouldn't trade them for anything. 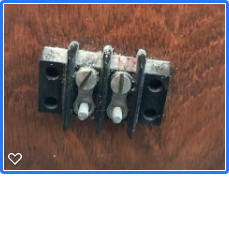 I've always had trouble getting a good connection to those small screws on the binding posts (see pic attached). Can you recommend the best action? 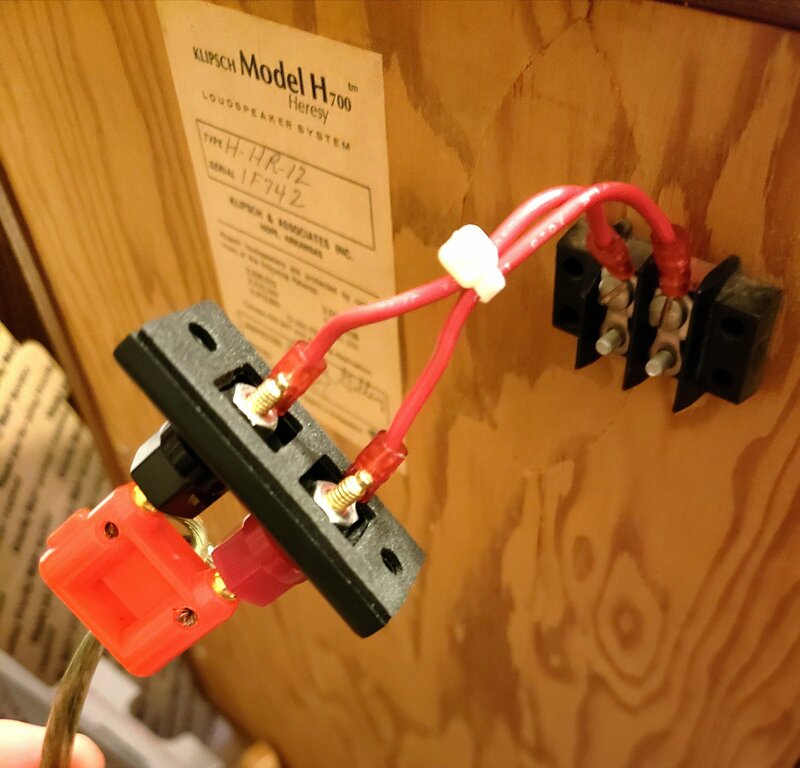 Is there a preferred method of connecting bare wires to these posts that I'm missing? Is there something I can do without drilling holes in the speakers...that fits the existing tread size. Am I just all wet and need to replace the posts? If so and with minimum changes, what should I do. I need to change the caps, so I guess I'll use Crites kit unless someone says that's stupid. Should I replace the tweeter or midrange diaphragms? Bare wire to spade connectors will work. The small terminal block you show is the original and there will be two small screw holes in the back panel. Hence there are holes already. If you want ... as noted above wire into spades should make it work just fine. If you want to have binding posts, I have used these ... from Parts Express ... on sale for $5 USD per pair until end of day today ... regular $7.78. Just drill the existing hole(s) out a bit more for the size of the binding posts, although you may have to change the spacing a bit. It also means you have to open the back hatch to attach the inside wiring to the posts. This isn't bad, as you should tighten all the connections to the terminal block on the crossover anyhow and generally have a look around, clean inside a bit and be sure no loose connections to the drivers. Crossover change out is up to you. If you solder, you can do the change outs or purchase ones e.g. from BEC. Otherwise, only change things if you want to get into that ... there is a ton of information on this forum ... all the way from the simple changes above to lots of time / minor money, changes in drivers etc. if you are in Houston I can give you the proper size spades. Some old one made with tinned copper. Also have E. F. Johnson binding posts. Takes a larger hole even without the insulating washers. Cleaning the connectors up is a good thing. The humidity is hard on the connections and the exposed copper wire. My ‘78 Heresys have the same connectors. I wrap the speaker wire around the screw counter clockwise.As you tighten the screw it tightens the wire with it. If you wrap the other way as you tighten the screw it forces the wire away from it. Never had a problem. My ‘73 Lascalas are connected the same way. You need spade crimp connectors, available at any hardware store. Get the blue ones; they fit typical 16-18ga. wire. Buy a stripper/crimp tool while you're at the store if you don't have one. Strip the wire, crimp on the connector, put it under the speaker terminal screw, tighten down, and you'll feel all "pro". Thanks for your help. Attached close up of terminals. Yes, these are the original binding posts. 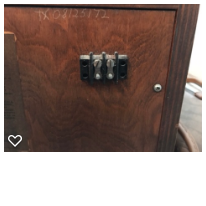 They have a pair of female connectors with the original screws in them and male posts sticking out. I've been using the top screws. I will certainly clean up the posts before putting back in service. My problem with connecting wires is keeping all the wires under the screw when I tighten them. Maybe it's a good connection and I'm fretting over nothing. But I think I'll crimp on some spade connectors like suggested. PM your address and I will put a handful in the mail to you. I have a few of the 1/4”& 3/16” Blue connectors. Quality, USA connectors. Got a soldering iron and solder? Strip the end of the wires clean, wind them up, tin them, and form hooks. though that isn't pretty...it looks better than the way I have mine connected with the cheap gold (colored I suspect) connectors...nice advice in this thread! John A did you make that custom binding post?? Where can I find 2 of those??? Very nice!! Looks like he just made a couple jumper wires. I'd just remove the old screw terminals and replace them with 5 way posts. Ok sounds good. Heading to parts express! This would be better I think. Thanks ricktate. My use would be for Lascala. Im looking for ways to make that an easier/better connect. A trip to parts express is always fun!